Nec display Large Format Displays (LFD) are an indispensable part of digital signage, as well as for presentations and interactive meeting room applications. NEC displays stands for a safe investment secured by high quality components and design, plus high operational safety. 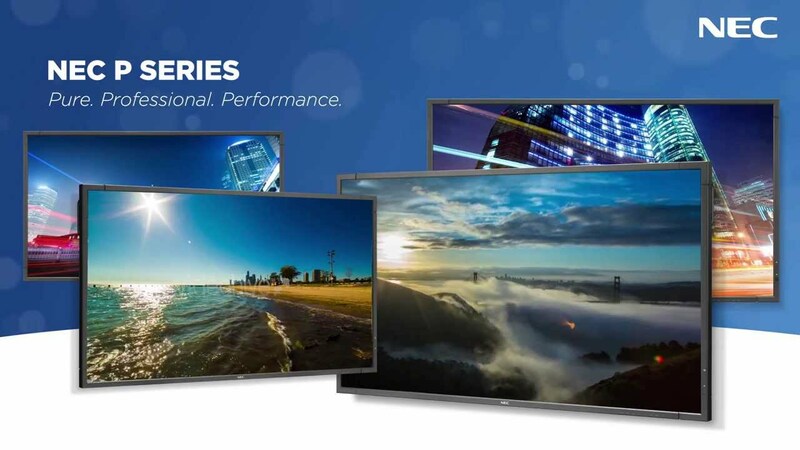 With a broad choice of LFD ranges and numerous customisation options, NEC delivers tailormade display solutions.Enter the world of digital signage with NEC’s prosumer displays. Designed to bring NEC’s heritage of performance and quality to cost-conscious yet demanding customers, the. Operating standalone via an integrated Media Player, signage starts automatically with the embedded auto-start function.Adaptable, scalable and modular, NEC video wall solutions offer unlimited creativity in delivering a seamless viewing experience. Responding to all high quality demands such as 24/7 operation, centralised control, colour accuracy and uniformity; the NEC displays in dubai, UAE offering also includes pre-configuration and mounting solutions, content management and after sales support. Meeting rooms are evolving into multi-usage spaces. NEC’s InfinityBoard displays is designed to fit every meeting scenario, whilst perfectly fulfilling your needs for a powerful and scalable workspace. Brainstorming, reviewing, video conferencing or collaborating – whatever the objectives of your meeting, the Nec Display InfinityBoard presents a perfect fit modular solution to achieve your desired meeting room space. Meeting rooms are evolving into multi-usage spaces. NEC’s InfinityBoard display is designed to fit every meeting scenario, whilst perfectly fulfilling your needs for a powerful and scalable workspace. Presenting, brainstorming, reviewing, video conferencing or collaborating – whatever the objectives of your meeting, the InfinityBoard presents a perfect fit modular solution to achieve your desired meeting room space. Enhance your meeting and conferencing performance with stunning UHD resolution with Nec display. Get high-end quality and reliability at a low total cost of ownership with long life-times. Professional haze levels ensure great visibility without distracting reflections – along with brightness of up to 350 cd/m², the NEC MultiSync C Series meets the demands of today’s meeting environments. Slim bezels and a modern appearance complement state of the art architecture to integrate perfectly into interior designs. With embedded office functionalities, start-up ad-hoc meetings without the hassle of setting up the display environment first. Wake-up on connection is just one of many features which make meetings more efficient. Models are MultiSync V984Q, MultiSync V754Q, MultiSync V864Q, MultiSync C981Q, MultiSync C861Q, MultiSync C751Q, MultiSync C551, MultiSync C501, MultiSync C431, MultiSync V554-RPi, MultiSync V484-RPi, MultiSync V404-RPi, MultiSync V554, MultiSync V484, MultiSync V404, MultiSync V323-2, MultiSync V801 and MultiSync V652. Modular and scalable, NEC’s MultiSync P754Q display brings powerful capability for best-in-class large screen visualisation. Deliver your message with impact and seamless simplicity for the most convincing results. Other models are Modular and scalable, NEC’s MultiSync P484 display brings powerful capability for Digital Signage. Deliver your message with impact and seamless simplicity for the most convincing results. Compelling readability even in bright ambient light conditions is guaranteed with high brightness levels of 700 cd/m² combined with an anti-glare surface. Its modern, slim design forms an elegant digital surface which perfectly complements the surrounding architecture and integrates seamlessly into any environment. The wide range of connectivity options and compatibility with high resolution signals up to 4K/60Hz secure a futureproof investment. The Open Modular Intelligence (OMI) approach provides tailor-made Signage Solutions, where scalable computing power such as Raspberry Pi compute modules or OPS Slot-in PCs are seamlessly embedded into the display. Interactivity and collaboration inspires your audience and attracts a crowd – whatever the application, NEC’s Modular Touch System brings interactivity to video wall solutions and invites multiple users to engage, share and have fun. The NEC Modular Touch System with its modular multi-touch frames allows scalable video walls in landscape and portrait orientation of any size up to 6 m wide. The solution is based on ShadowSense touch over-frame kits and NEC’s 55” ultra-narrow large format MultiSync X555UNS PG with integrated protective glass. The NEC X554UNV-2 sets the standard for reliability in video wall technology. Featuring a minimal 3.5 mm bezel, these display modules create impressive high-resolution video walls with barely visible image gaps. Supporting consistently accurate image rendering and high operational security, they are designed for the rigor’s of 24/7 operation. Perfect readability under common light conditions is guaranteed thanks to a brightness output of 500 cd/m² together with an anti-glare surface. An advanced set of intelligent features make the displays easy to install and operate and support significantly reduced maintenance requirements. The 55” display is ideally suited to create huge screen surfaces that demand attention. With the all new NEC displays X754HB connecting with customers has never been easier, smarter or brighter. Whether in public places, a window storefront or at the airport, this 75” high brightness display will make sure your advertising campaign or crucial information like flight data is visible to your audience in any lighting condition. Viewers are automatically recognized by an optional human sensor and screen settings adjusted to make sure that your message will shine in the crowd. The high-performance display will capture your customers with a stunning visual experience, even wearing sunglasses, while minimizing unnecessary power use through a programmable ambient light sensor. Enjoy a new era of visual experience with an expansive digital canvas delivering pixel-free viewing. This vast 98-inch (248 cm) Ultra High Definition (UHD) screen is commanding in its presence making it perfectly suited for reference applications and larger meeting groups up to 15 people where intense detail and colour accuracy is demanded. The 3840 x 2160 resolution facilitates both distance and proximity viewing with precise colour fidelity regardless of the viewing angle for a reality-like visual experience. Designed for 24/7 operation and offering high usage flexibility thanks to its wide connectivity, this screen provides future-proof investment security. The NEC MultiSync V554 PG combines professional protection of your investment with thrilling display performance. Deliver your message with impact and seamless simplicity for the most convincing results. Guaranteed reliability even under the toughest conditions is achieved with the super robust 4mm thick protective glass designed to withstanding external impacts. The anti-reflective glass surface combined with brightness levels of 500 cd/m² provides crisp and clear images and readability from different viewing angles and distances. How can you shine out in the crowd and win attention to engage your customers? Invite your customers on a fascinating journey where Digital Signage blends seamlessly with fitting room mirrors. The semi- transparent mirror glass of the NEC MultiSync P554 MG creates a captivating interplay between a real mirror and a signage display. Retailers can offer additional and targeted information such as size range, colours or coordinating accessories while allowing the shopper to use the mirror surface to check the look and decide on their favourite styles. Guaranteed reliability and readability even under tough conditions is achieved with the super robust protective glass combined with high brightness levels of 700 cd/m². The NEC Interactive Multi-Pen Whiteboard Kit is an ideal solution to create an interactive world of experience and attendee participation in classrooms and the corporates. The Kit includes the NEC Multi-Pen Projector UM351Wi, including wallmount, as well as a high quality 88 inch (223,5 cm), 16:10 whiteboard. The interactive pen transfers the actions on the whiteboard directly to a fixed sensor module at the projector that needs only a single calibration with consistent accurate writing and drawing results. Nec displays is market leader for display solution.